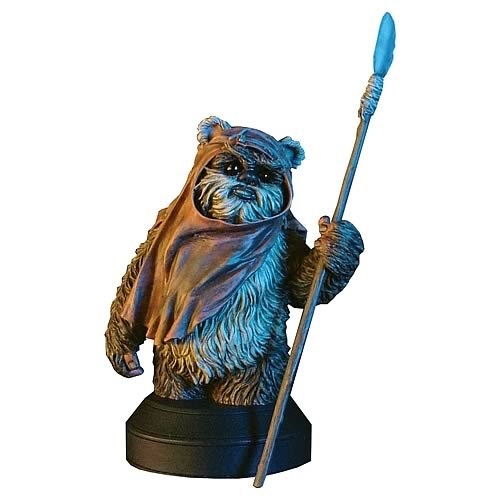 Product Detail Summary: Endor's own Wicket W. Warrick is here as a mini bust for all you Ewok lovers! The big-time hero from Star Wars Episode VI: Return of the Jedi. Limited edition statue of the valiant scout and fearless Ewok warrior! Wicket W. Warrick, the valiant scout and fearless warrior from Star Wars Episode VI: Return of the Jedi, led an adventurous life, befriending Princess Leia and R2-D2, as well as helping the Rebel Alliance fight off the invading Galactic Empire. This brave little Ewok proves that big heroics can come in small packages! Cast in high-quality polystone at a little under 5 1/2-inches tall, and then hand painted for the richest in detail, this Wicket statue is a numbered limited edition that comes packaged in a window box with a certificate of authenticity. The Wicket the Ewok Mini Bust is just right for all you Ewok lovers out there. Yub Nub! This will be a valuable piece due to collector interest, its limited numbered edition, certificate of authenticity and highly collectible window box!! !